The Cadillac CTS-V is the ultimate American sports sedan. The LT4, General Motors’ 6.2 liter supercharged V8 engine sits under the carbon hood. Making 640 horsepower and 630 pound-feet of torque in Cadillac guise, the car is no slouch. Sixty mph is dispatched from a standstill in just 3.7 seconds, and the Cadillac CTS-V keeps pulling all the way to 200 mph. Brembo brakes, Gen 3 Magnetic Ride Control and Performance Traction Management all help to make the Cadillac CTS-V perform when the road, or racetrack, gets twisty. But what if that all that is not exciting enough for you? What if you need your V8 powered sport sedan to sound like it wants you dead? Well, Borla is here to help the owners of the 2016 Cadillac CTS-V and onwards who find themselves in that spot with their new Cat-Back S-type exhaust system. The exhaust piping itself is 2.75 inches in diameter, letting out to 3.5 inch tips that are finished in black chrome. 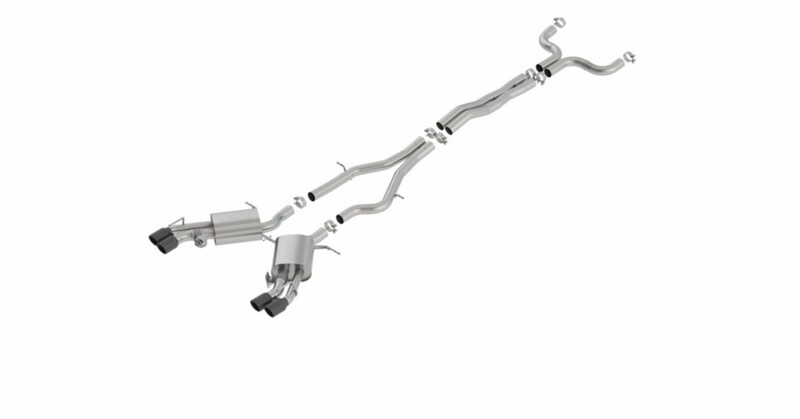 Like the stock exhaust system on the 2016 through 2018 Cadillac CTS-V, the Borla system includes active exhaust valves, which are covered by a three year warranty. Like all Borla products, the exhaust is constructed from high quality austenitic stainless steel. This is responsible for the higher than typical retail price, which exceeds $2,500. While the cost of entry is high, Borla has let their Cat-Back S-type exhaust for the current Cadillac CTS-V speak for itself. There is a noticeable drop in the exhaust tone as compared to stock, accompanied by the welcome addition of cracks and pops to the over-run. According to Borla, their products are tuned “with the mellow sound of power, aggressive yet elegant.” Additionally, Borla street products are 50 state emissions legal. If you have a 2018 Cadillac CTS-V and find yourself bored of the exhaust sound, Borla has come out with a solid option to change that. The 5 to 15 percent bump in horsepower that can be achieved from adding a cat-back exhaust system can’t hurt either.